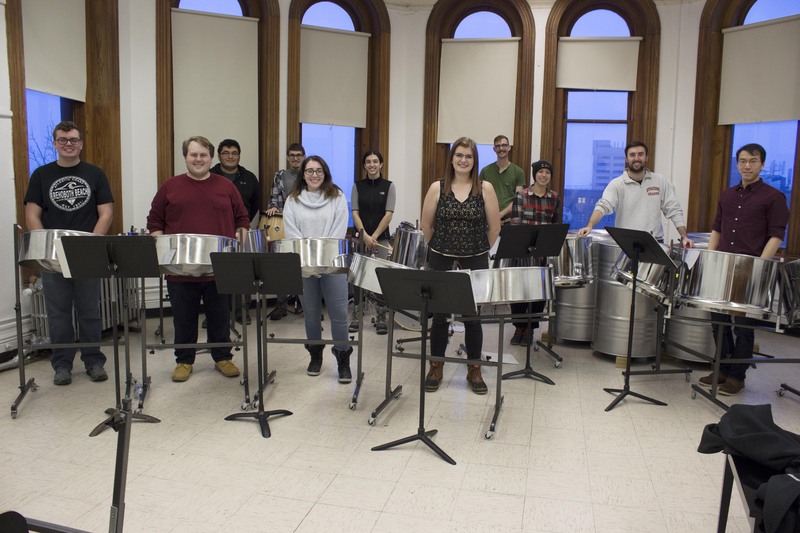 The members of the Syracuse All Steel Percussion Orchestra. SASPO is based in the College of Visual and Performing Arts’ Rose, Jules R. and Stanford S. Setnor School of Music. The band’s name is an homage to TASPO, a pioneering band from Trinidad that helped lead the development of this dynamic ensemble. Like other progressive steel bands, SASPO plays a wide variety of music, from jazz to classical, calypso to soca and rock to hip-hop. SASPO is directed by David Knapp, assistant professor of music education in the Setnor School and the School of Education. For an accommodations request, contact Bridget Yule at 315.443.9142 or bmyule@syr.edu. For questions about SASPO, contact Knapp at dhknapp@syr.edu.